View More In Fortune Telling Toys. Bring the solar system to your room,bring the mysterious universy to your kids and lovers - This little solar system glass ball fulfiles for good and all. Our solar system planets is made of high quality crystal,and we use special technology to keep it completely clear and no impurities inside the ball, good quality and perfect craftsmanship,will add a flavor of elegance and artistry to your room. This planet balls displays all eight planets (Pluto not indluded) with their moons in their orbits around the Sun,it could be an interesting solar system model for kids to initiate the universe. 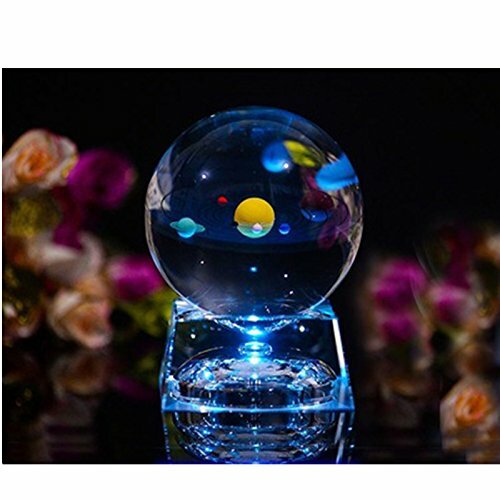 Glass planets come together with a LED crystal stand,the colorful LED light illuminates this solar toys,makes this crystal solar system more realistic,more beautiful and more dynamic. If you have any questions about this product by Zulux, contact us by completing and submitting the form below. If you are looking for a specif part number, please include it with your message. Fortune Telling Toys Crystal Balls Divination Tool See The Future Flower of Life Charge Crystals 10"